After arguably having done the same to Matt Bonner last year. Six years ago on the night of the 2011 NBA Draft, when the San Antonio Spurs shockingly agreed to trade coach Gregg Popovich’s “favorite player,” point guard George Hill, to the Indiana Pacers in exchange for the rights to Kawhi Leonard — they also received the rights to a little-known European player named Davis Bertans. At the time, Leonard was considered a solid prospect who might one day be as good or perhaps slightly better than Hill, while Bertans was considered a low-risk throw-in who might not ever make an NBA roster. Throw in two devastating right knee injuries in 2013 and 2015, and Bertans’ chances of coming to the NBA at times appeared very uncertain. Fast forward to 2017. Leonard has become one of the top players in the league while Bertans surpassed expectations during his rookie campaign last season — playing 67 games and starting in six of them. He averaged 4.5 points per game on 44 percent shooting from the field and recorded a 40 percent mark from behind the arc. While those numbers might not immediately jump out at you, he only played 12.5 minutes a game and did a fine job making the most of his limited time on the floor. Pop noted how impressed he was with Bertans, saying “His confidence and the way he comes into a game — he might come in at the end of the game, he might come in the middle and not expect to be playing — and he doesn’t miss a beat. He comes in and plays like he’s been playing all night, so that’s kind of cool.” Very cool, indeed. 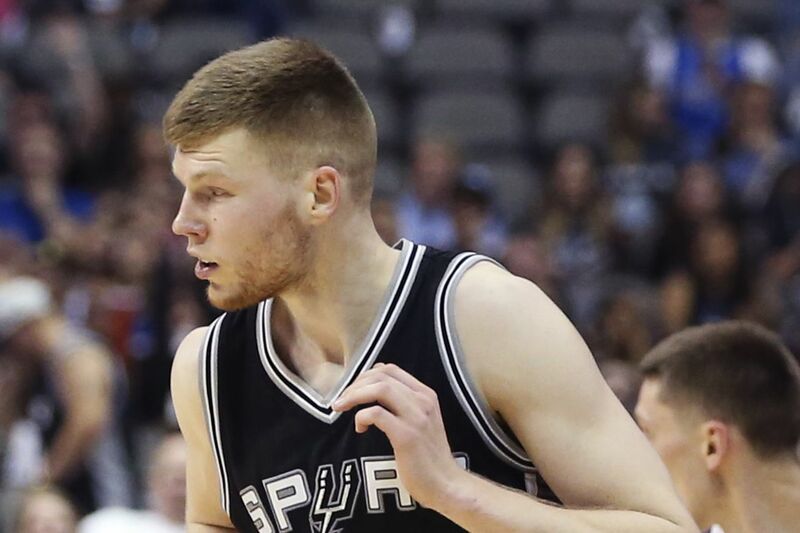 When Bertans came over last year, it made the decision to part ways with Matt Bonner easier. At 6-foot-9, Bertans is essentially a younger, quicker and more athletic version of Bonner. And just like Bertans took over Bonner’s role last year — playing sparingly off the bench and being a reliable stretch four — it’s fair to say that his capable play last season was a factor in the Spurs deciding not to bring back the older and more limited David Lee this season. The choice not to bring Lee back seems like it could have been a difficult one, being that he played played hard, knew his his role, was loved by his teammates and seemed a perfect fit for the team’s culture. Unfortunately for Lee, he’s never been an outside shooter, and that’s something players on this year’s Spurs team need to do. Throw in his lack of speed, his age (34) and a tough knee injury to end last season, and it made perfect sense why the Spurs wanted to move on and give Bertans a bigger role. Lee had the chance to come back to the Spurs too, but he turned down his player option for this season. Because the Spurs weren’t left with a ton of cap wiggle room once they signed Rudy Gay and took care of Pau Gasol, Manu Ginobili and Patty Mills, this proved to be the final nail in the coffin for Lee. Bertans, meanwhile, is still on a rookie contract. It’s clear that Bertans already has the trust and support of PATFO as well as his teammates, important for any young player. His confidence in his shooting, combined with the perseverance he showed battling back from two tough injuries, has helped mold him into the player he’s become. The scary part? He’s only 24 years old. Bertans will have to play with the same assured attitude he had last season. It’s fair to expect some sophomore bumps along the way as he grows into a larger role and more minutes. But his precise sniping from deep, combined with deceptive athleticism, makes him tailor-made for the prototype teams want their power forwards to conform to in today’s NBA. You can bet Pop is going to use him a lot more this season, and here’s hoping he seizes this opportunity by the throat and becomes yet another name in the long list of “draft-day steals” for the Silver and Black.